This October, the NFL will be playing three games in England as part of its NFL London series. All three games will take place at the famed Wembley Stadium, so we're here to get you ready for a jolly good game day. Wembley Stadium has played host to NFL games abroad since 2007. And it's one heck of a venue if you've never been. And if you have, then you probably agree. This fall, the NFL returns to London with there NFL London Games: the Oakland Raiders play host to the Seattle Seahawks on October 14th; the Tennessee Titans take on the Los Angeles Chargers on October 21st; and the Jacksonville Jaguars and the 2018 Super Bowl Champs, the Philadelphia Eagles, wrap up the London series when they face off on October 28th. If you're an American visiting London for one or more of these games, you are in for a treat. Wembley is located in west London, about 45 minutes by car from the tourist center of London (we Google mapped it from Big Ben, for example). It is perhaps more easily accessible for the masses by the tube, reachable on both the Jubilee and Metropolitan lines. The stadium itself is considered by Brits to be the "spiritual home of English football" and an incredible game day destination for sports fans more generally. Packing in 90,000 screaming fans at full capacity, Wembley plays and has played host to the English National (Soccer) Team, the FA and EFL Cup finals, the FA Community Shield, the 2011 and 2013 UEFA Champions League finals, the 2012 Olympic Games gold medal soccer match, rugby's Challenge Cup final and a plethora of big, big concerts (think Queen Bae, Madonna, Michael Jackson, Queen, Oasis, Eminem, Coldplay, Foo Fighters, U2, etc). In addition to being the NFL's London home, it will also host the 2020 UEGA Euro Championship final in 2020. So yeah, over all, not a bad or unpopular place to watch sports (or go see a concert). If you're used to American tailgating, beware: while there is parking at Wembley, it's quite limited. (Plus SUVs and pickup trucks, smokers and our other tailgating go-to's aren't so popular over there). That said, you can book parking in advance here. Don't let this get you down though. The NFL does a pretty decent job setting up fun fan activations around the grounds. Check out this video shot by a 49'ers fan at Wembley 8 years ago. 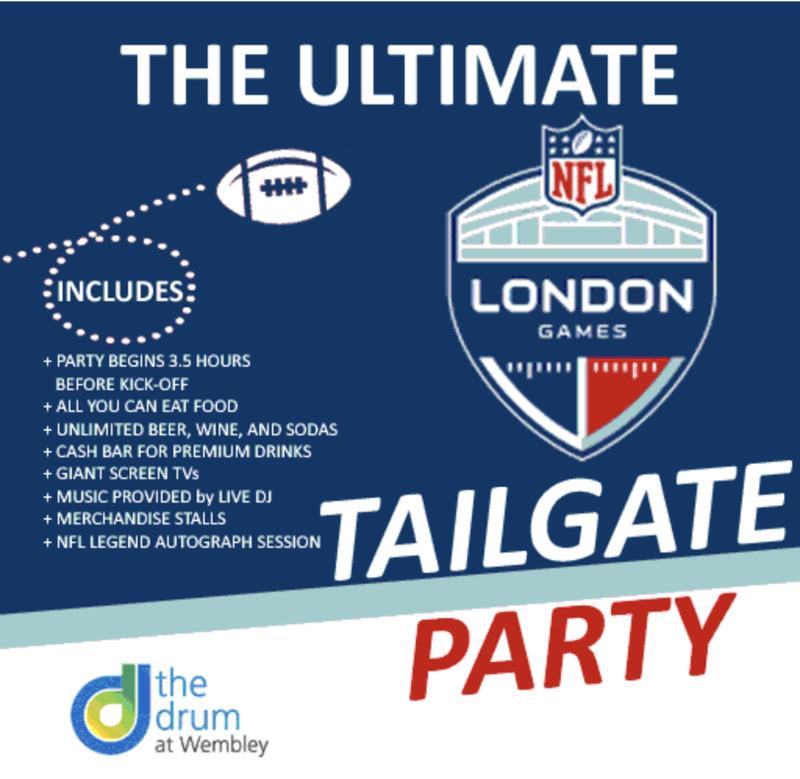 You can also head to the organized NFL London Tailgate, which is being held at The Drum on the grounds of Wembley. Do make note that this is a ticketed event, with tickets going for £75 (about $98). An English breakfast usually consists of eggs, breakfast meats (bacon, sausage, sometimes haggis), beans, toast, cooked mushrooms and roasted tomatoes. People generally seem to be a bit divided on their adoration for this selection—but if this is ultimately your bag (baby), then there are some great breakfast spots you should check out that aren't too far from the stadium. Ecco'la Café and Pizzeria: A super cute Italian spot that opens early at 9am on Sundays and serves a mean breakfast, including a big English breakfast option (and other more Italian-style breakfast items). Blue Check: For those of you looking for a later breakfast, they open on Sundays from 12-2 and feature fairly standard pub fare. But it's good and very close to Wembley. Sunrise Cafe: The place for a very solid English breakfast. Heads up: cash only. J.J. Moon's: They open at 8am for those ready to get their game day on early. The prices are pretty good and for a pub they do a solid English breakfast. Note: this is also a great spot to grab some pints before the game if it's beer o' clock for you. There's plenty of choice when it comes to pubs within walking distance of the stadium. The Wembley Tavern, found five minutes from Wembley Park station, is always bustling with fans ahead of kick-off. Green Man on Dagmar Avenue is within easy strolling distance of the ground, while Greene King pub The Torch — located just north of Wembley Park station — is one of the liveliest on match days. Fans walking in from Wembley Central can also pass by Thirsty Eddie’s on the High Road, which is great for Guinness. Fans on a budget should also visit JJ Moons, a Wetherspoons located just down the road. A little further afield, the Globe pub opposite Baker Street station is usually busy with fans looking to enjoy a few drinks before heading into Wembley, too. And finally, one helpful tip to keep in mind: On an NFL Sunday, pre-game, a lot of the door staff at these places may not let you in without a ticket to the game. Once the game is over, it's usually a congested mess of a commute back to Wembley Park station. People hang out and loiter on Wembley Way, waiting for the crowds to subside. (Remember, this stadium to seat 90,000 people! That's 90,000 folks all looking to get home). To avoid these crowds, we suggest hanging back and maybe grabbing a bite. One option is to head to the London Designer Outlet, which is close to the west end of the stadium grounds. Here, you'll find a bunch of food chains in London such as Pizza Express, Zizzi, Wagamama, the Handmade Burger Co and Prezzo. There are also places like Las Iguanas to grab a drink. Ealing Road is a street found close to Wembley Central station and we are told it is the place to go for a curry. Choose from these spots: Gana, Palm Beach Restaurant, Masala Canteen and Dosa Express. If you're vegetarian, check out Savaravanaa Bhavan. Head here for more of London's best greasy spoons. Safe travels to the game and enjoy, football fans!! !